My Secret Garden whimsical needlepoint by April Murphy from Maggie Co. featuring a cat hiding behind a bush is the perfect needlepoint for cat lovers. 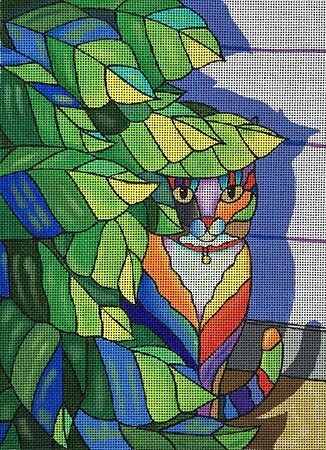 This hand-painted contemporary cat needlepoint design measures 7.5" x 10" on 18 mesh canvas. If you want to mount your canvas on stretcher bars to hold it taut while you stitch then we recommend purchasing a pair of 11" and a pair of 14" stretcher bars with thumb tacks.